While we’ve been gawking at the scenery almost twenty four-seven, what we haven’t been doing much of is cooking, much to my dismay. The dairy here is ridiculously good – I’ve been eating massive amounts of skyr (a kind of Icelandic yogurt-ish soft cheese) and Icelandic butter. I did manage to make a quick breakfast the other day, but for the most part I’ve been missing messing around in the kitchen. I always find it charming to cook while on vacation – there are so many quirks and questions, the most important of which is: is there a sharp knife? I actually travel with a tiny knife sharpener, so if I need a sharp knife, it’s just a quick sharpen away. You definitely need a sharp knife to prepare these chicken strips, which, incidentally, I did not cook in Iceland. I made these a couple of days before we left; I cooked up a storm, partially because I was cleaning out the fridge and partially because I wanted to line up a couple of posts in my back pocket. 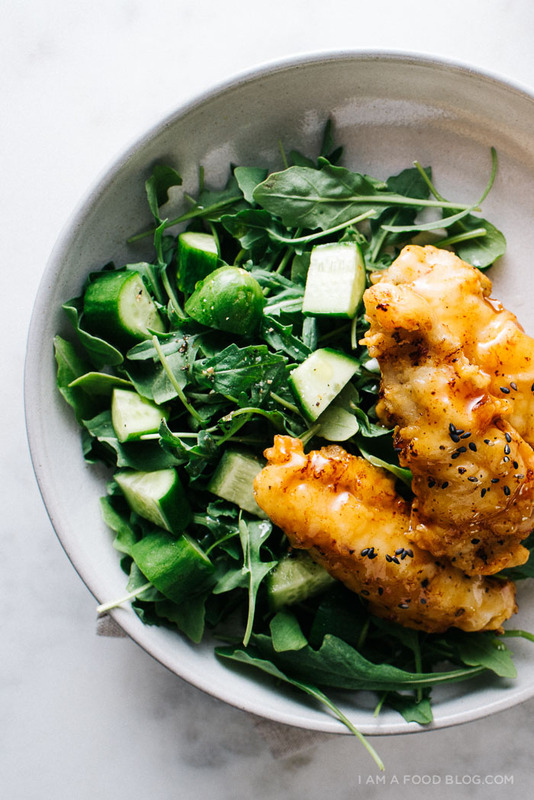 These guys are juicy, crispy, and absolutely addictive. I have an unabashed love for chicken strips. If I’m in the mood, I’ll order them off the kids menu, just because they’re so good. 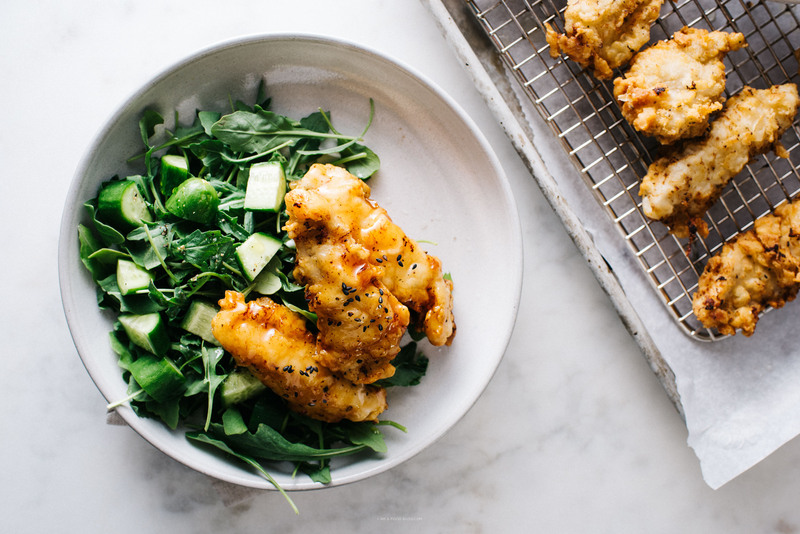 What’s not to like about a crispy juicy piece of chicken? Even better if the chicken’s been soaking in a buttermilk bath for a bit more juiciness and depth of flavor. I served these guys with sweet and sour sauce because sweet and sour and savory is my jam. Sweet and sour sauce super easy to make at home and perfect for dunking (or drowning in). PS – Happy Thanksgiving’s Eve and to all my American friends and I hope you need those stretchy pants tomorrow! 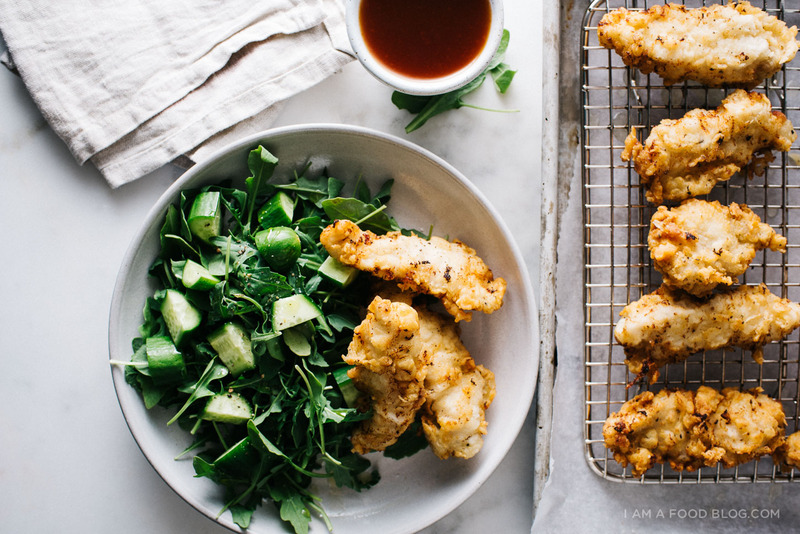 Soak the chicken strips in the buttermilk along with the salt and freshly ground pepper for 30 minutes to 1 hour in a cool spot in the kitchen. You want the chicken to come up to room temperature so that when you fry it, it doesn’t drop the temperature of the oil. Near the end of the hour of soaking, make the sweet and sour sauce. 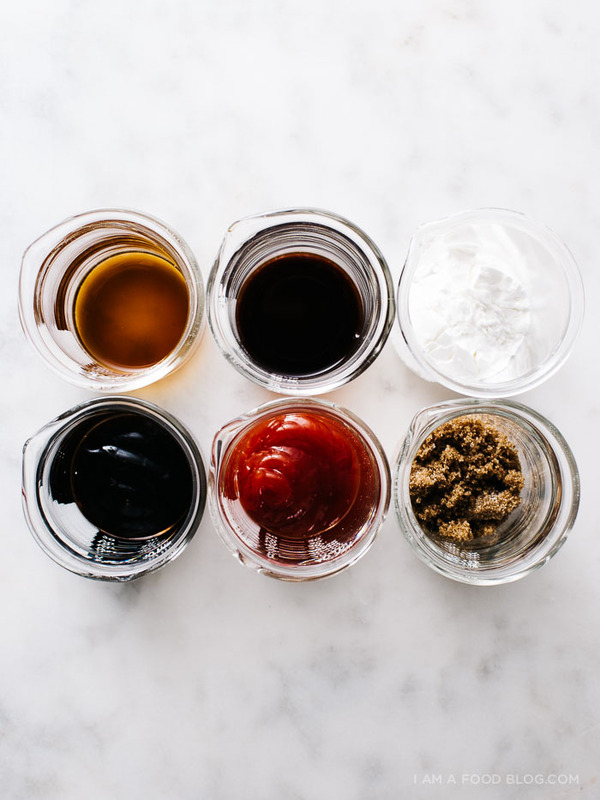 In a small sauce pan, over medium heat, whisk together the sugar, ketchup, soy sauce, rice vinegar, and water. Bring to a gently simmer and then whisk in the corn starch slurry. The sauce will thicken slightly. Taste and season with salt and pepper, if needed. Turn off the heat and set aside. In a shallow container, whisk together the flour, garlic powder, salt, and pepper. 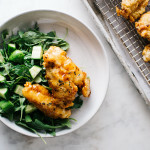 If desired, whisk in the two extra tablespoons of buttermilk to form large clumps – these are added extra crispy bits. 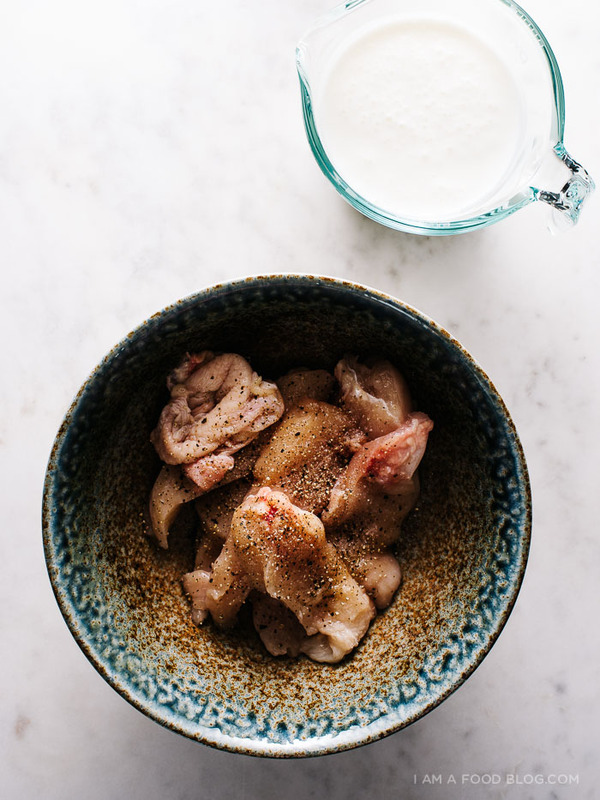 Take a strip of chicken out of the buttermilk, shake gently, then coat in flour, pressing to ensure all sides are covered. Place on a tray and continue to coat all of the chicken. Heat up at least 2 inches of oil (I prefer rice bran or grapeseed) in a deep cast iron or heavy bottomed pot over medium heat until 375°. 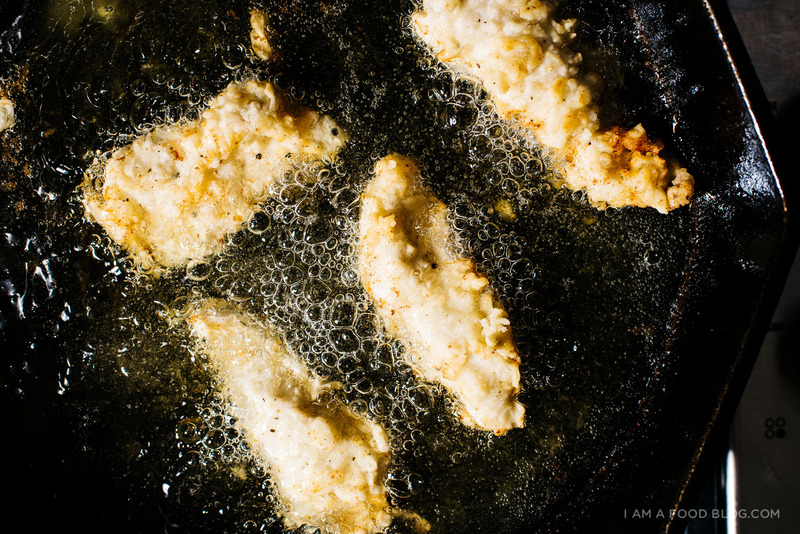 Carefully add the coated chicken to the hot oil and deep fry in batches, being careful not to crowd the pan. Flip occasionally as needed, until crunchy, brown and cooked through, 5-8 minutes. Let cool slightly on a wire rack. Drizzle or toss with the sweet and sour sauce and enjoy! How did I miss all your Iceland posts??? They’re beautiful!!!! I can’t wait to go myself. One day, some day! i’ve been loving your ig posts! another place to add on my looong list of places to go (: and there’s never a bad time for fried chicken, even when one is gearing up for a massive thanksgiving (i’ll go back to tofu and veggies next week). Can you bake the chicken instead of frying it? i haven’t baked these before, but if you’re looking for crispy baked chicken, i recommend this recipe using chicken instead of turkey. I absolutely can not get enough of your site. The pictures are always sooo mouth-watering and I crave them instantly. Can’t wait to try this. This looks great! I love chicken strips. I am all about crispy chicken strips too. They’re pretty much impossible to resist in my opinion + I love the idea of the dipping sauce. Loving your pictures from Iceland; it’s not somewhere I’ve really thought about visiting but it looks magical. Hi! Wow this recipe looks delicious and I will have to make it very soon and try it for myself. For medical reasons I am on a new diet and I have been trying to find recipes I can make that works with my diet and this will work perfectly! Would you consider this easy to make if I follow the recipe very closely because I’m still a fairly new cook. How many times have you made this? Cannot wait to look through your other recipes to see what else I can make! i think it’s easy to make, but it’s always difficult to judge :) frying things in hot oil can be intimidating! 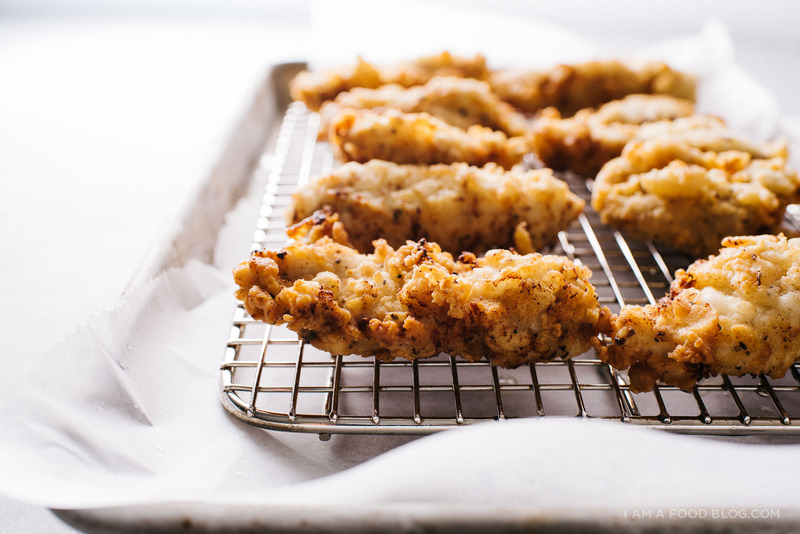 if you’re a new cook and you’re looking for chicken recipes, it might be better to try something that’s been baked – try this recipe http://iamafoodblog.com/baked-turkey-tenders-recipe/ but use chicken and 1.5 cups breadcrumbs instead of the english muffin and chips. Traveling with a tiny knife sharpener is genius! Knives in hostels and such are almost always pretty dull. Which one do you use? it’s a little one from ikea. it works pretty great! I made this recipe recently and loved it! I have guests coming over and I want to make it for them but they can’t eat dairy. Would it still work if I substituted the buttermilk for say almond milk instead? i haven’t tried with almond milk but i think it would work, just make sure the almond milk you use is unflavored and unsweetened! This is absolutely delicious. I have tried many chicken strip recipes. This is the best. Must add the buttermilk into the flour…it makes the recipie! i know i’m like three years late to the party but i just wanted to thank you. i’m nervous about deep frying but this worked perfectly! will reuse this buttermilk + flour technique again and again..